After spending over a month in the Quad Cities building new rafts and modifying the old ones, we are itchy to set our fleet loose on the Mississippi. From the start, this project has not been simply about reaching our destination, but about the impact and interaction between ourselves and the communities that we visit. Last year we spent a few days (or longer) in each of the towns we visited doing workshops (silkscreening, leather working, calligraphy, slackrope walking) and putting on performances. This year our crew has been working on a full length performance, complete with sequins, accordians, marionettes and a Tall Bike joust. We hope to set sail soon after our performance. But… we are still in need of engines! 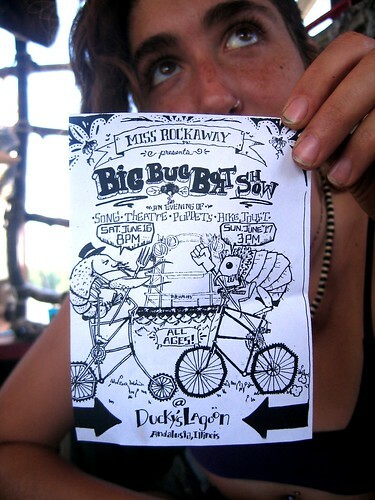 Come see “The Big Bug Boat Show” at Ducky’s Lagoon in Andalusia, Illinois. Saturday, June 16 @ 8 P.M.
Sunday, June 17 @ 3 P.M. The Armada is still going strong! Updates from the river will be coming soon. Some of us who have returned to New York will be sharing photos and stories of life aboard the Armada at PS1 this Saturday at 3pm. Come by and say hello if you’re in the New York area! 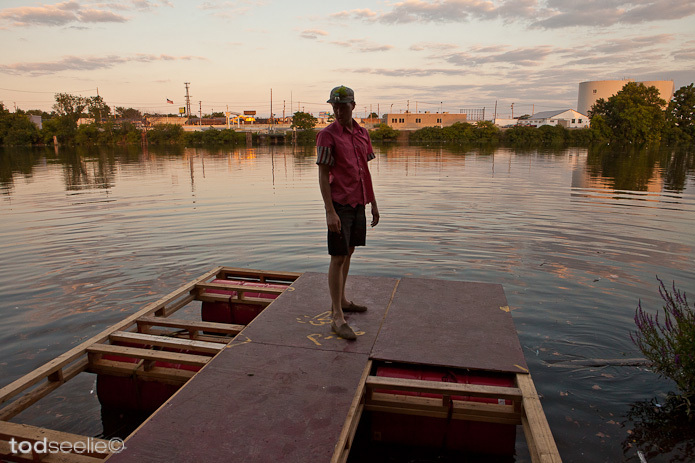 (Long Island City, NY – September 19, 2006) P.S.1 Contemporary Art Center is proud to present a slide show and discussion of the Miss Rockaway Armada, an artist-organized journey down the Mississippi River on a flotilla of hand-fabricated rafts. You are currently browsing the The Miss Rockaway Armada weblog archives for the news category.